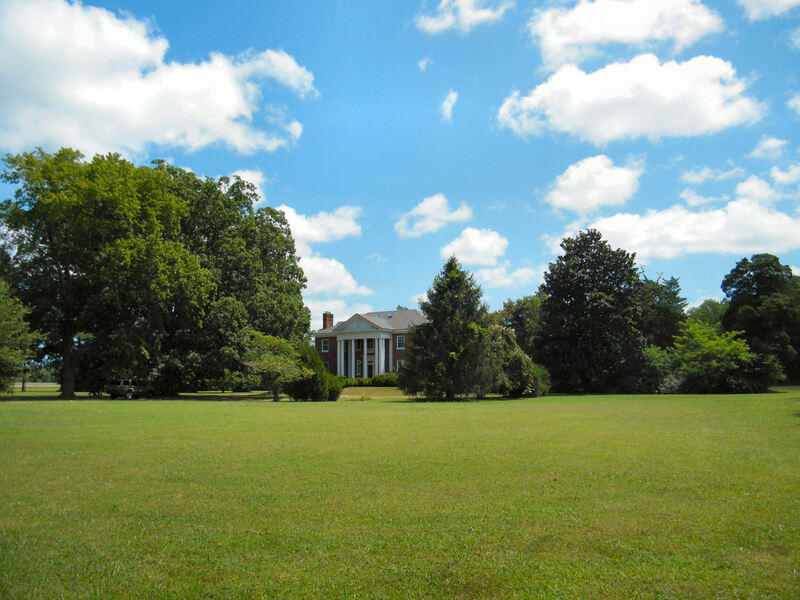 Auspiciously, this magnificent historic home listed for sale by Blue Heron Realty Co. is located in Belle Haven, VA, a little Eastern Shore of Virginia town which straddles the county line between Northampton and Accomack County, a beautiful retreat, which indeed this home is. Of dramatic neoclassical design, its most striking architectural characteristic is the line of tall Doric order style Greek columns which dramatically define the entry portico. ( Interesting bit of trivia, in ancient Greece, the height of a column was described as “diameters” of height, a ratio between the width and height. So what we would describe as an 10″ column 10′ tall would have been said by the Greeks to be 10 diameters high although apparently Doric order columns were often not much more than 8 diameters high whereas the more elaborate Ionic order columns were generally 9 diameters and the ornate Corinthian order columns 10 diameters high. All that being said, in this post I’ll just detail the height in feet, 20 feet tall to be exact, and not diameters.) 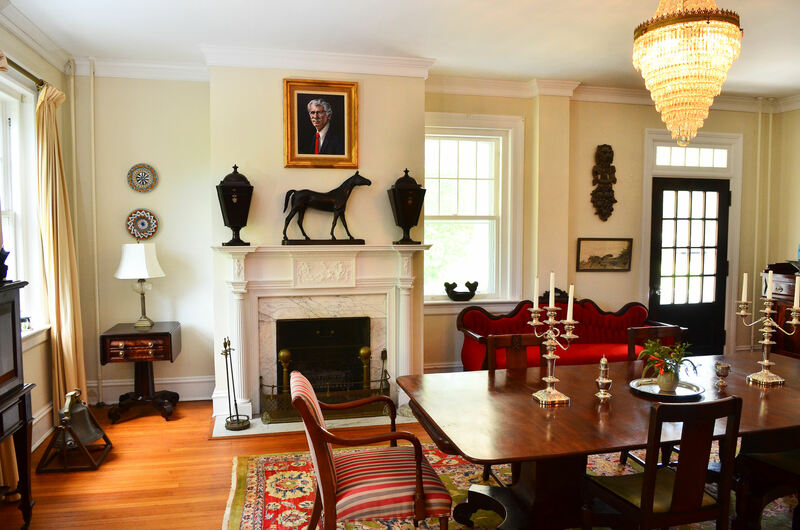 I mention this detail about the imposing columns because only a very few historic homes on the Eastern Shore were built in this really grand style, making this particular home even more special. Custom built in 1912 for a very prominent local doctor whose offices were in the basement, according to local lore, this was the very first house on the Eastern Shore to have both telephone and electricity– it even had a built-in tube intercom system throughout, one of the newest gadgets of that era. Complimenting the elaborate inside features is its magnificent facade, three course thick brick embellished with large modillions and intricate dentil moldings. Walking up the marble steps and into the house, one is struck by the spacious size of the foyer and its light and airy feel. 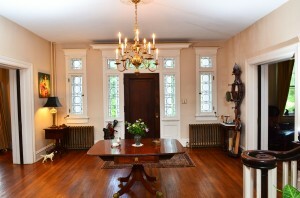 This is because not only does the solid mahogney front door have double set of elaborately etched leaded glass sidelights and transom lights, but the current owner has installed seven skylights including a large skylight centered over the elegant cantilevered staircase so natural light streams gently down, bathing each floor with uplifting golden sunlight. Together with the many windows throughout, this home is much enlivened with the warmth and brightness of natural daylight, giving each room a relaxed, very pleasant feel. 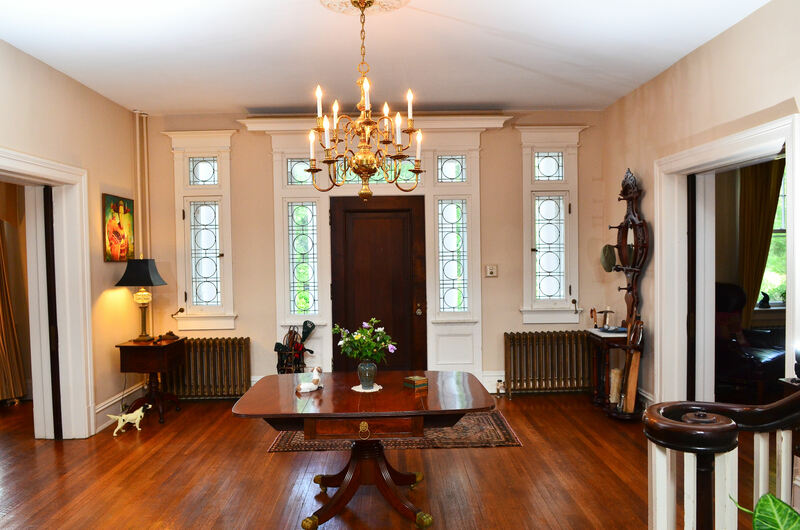 Interior details include all original woodwork and original hardwood floors, elaborate crown moldings throughout, wainscoating in many rooms, four sets of massive pocket doors, hinged doors throughout constructed of top quality mahogany and still retain their original crystal doorknobs, seven elaborate fireplaces with hand carved mantels plus a simply gorgeous antique crystal chandelier which highlights the spacious dining room. Close to the back stairs accessing the 2nd and 3rd stories is a large Butler’s Pantry which features the original sink and cupboards. Hoping for a cozy spot to curl up with your favorite author’s newest book ? Try the large library with floor-to-ceiling bookcases and a great fireplace ! It’s a very comfortable feeling room, the kind of room that is heavenly even on a cool, grey, rainy day, a crackling fire burning, a steaming mug of java at the elbow, stretched out on the sofa, toes encased in toasty fleece sox, soft music in the background, yep, heavenly is the word for it …..
Love open air lunches ? Two large porches, one screened, one open, stand for scads of comfy wicker outdoor furniture with colorful, thick Sunbrella cushions, the better to enjoy our balmy summer breezes. 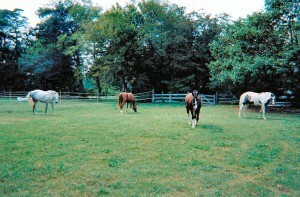 Love horses ? 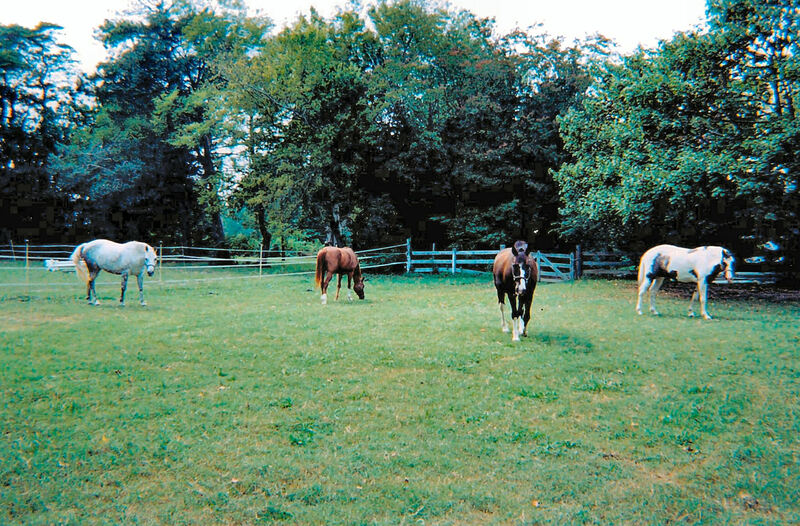 The property includes a horse stable and the house is available with 5 acres up to 24 acres, so lots of room possible for pasture. Close to shopping, boat ramps, restaurants and marinas. Two public beaches are located less than 20 minutes away . This is a wonderful, versatile home, lovingly built, featuring fine craftsmanship and only the very best materials. Call Blue Heron Realty Co. at 757-678-5200 for pricing details and more information on available adjacent parcels. This entry was posted on Monday, October 3rd, 2011 at 11:51 am	and is filed under Historic Homes, Our Little Towns, Real Estate, Virginia History. You can follow any responses to this entry through the RSS 2.0 feed. Responses are currently closed, but you can trackback from your own site.